You are here: Home / local business directories / Are Your Listings in Local Business Directories Accurate? I was checking the search results for my business name, Merit Solutions Australia, in Google and was surprised with the results from local business directories. 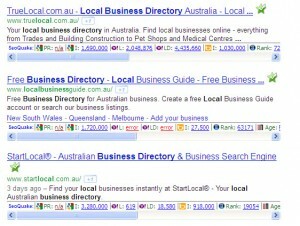 A lot of the entries in the first two pages of Google results were listings from local business directories. 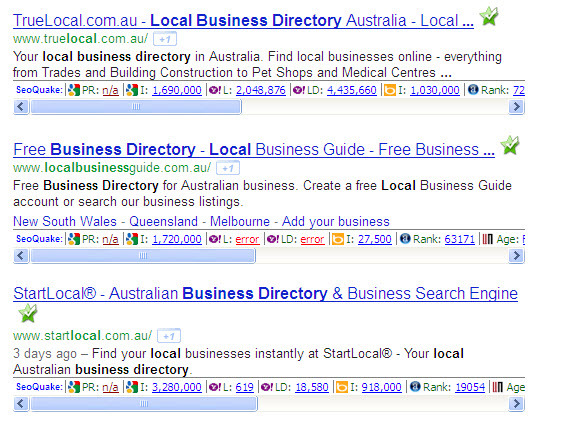 These directories create business listings (much like Google and Facebook have done recently) by scraping content from the Internet. The only problem with the local business directories, as I found, is that a lot of the information is incorrect (because it is out of date). So I noticed that while local business directories had eight (8) of the listings in the first two pages of Google results, most of them had inaccurate information – wrong address, phone numbers or business categories. So I set about correcting these entries. Most of the listings are free, so all you need to do is go to the site and claim your listing and update it. Some allow you to add your logo and images, so it is well worth the effort to get accurate and comprehensive information about your business on the first two pages of Google results for searches on your business name. Some of the local business directories also offer “premium” or paid listings – but you need to evaluate these offers in the light of the ranking of the site, the potential additional traffic and the added value in terms of potential increased sales. An added benefit of listings in local business directories is that these sites often have high page rank – in other words, Google values their content and gives them high ranking in search results. This means that your listings create quality backlinks to your site and thus add value to your own website/blog. One of the key local directories is hotfrog.com which has a Page Rank of 6 and is ranked (in terms of traffic) in the top 6,000 sites in the world. So whatever you do, make sure your listings in local business directories are accurate.